Morning all...I'm waiting for Andy to get back from his 'lads holiday' (I always go "wheeeyyyy" in a laddy fashion when I say that...loser!) and still feeling rather sad about my little Doz, so thought I'd kick back with a cuppa and give you all a Sunday Snip to read. Thank you all so much for your comments, massive hugs to you all. Made me feel a lot better. You may have noticed Sunday Snip was missed last weekend, I'm going to do it fortnightly if that's cool, coming up with fun facts and tips for you is taxing on my little brain! :) I'll still post something on a Sunday - maybe some more outfits if you'd like? Along with bone marrow, hair is the fastest growing tissue in the body. If you fancy a 60's inspired beehive with vertical roll, keep the look secure by criss crossing grips and finishing with a grip placed in the opposite direction of the rest. Holding power right there!! In Tudor times a married woman would be discouraged from wearing her hair loose. Even Anne Boleyn, rumoured to have had hair down to her bum, kept her hair under a hood to please Henry...not that it helped her in the end. Aussie Volume Mousse, a great product, and a must for the big blow drys seen on the catwalks recently. A golf size ball will give you bounce and volume Cheryl would be jealous of. Diana Vickers. I am loving her new fringe and shaggy layers. She's been an absolute hit at LFW and I love the structured high fashion look with the relaxed boho hair. Gorgeous girl, what do you think? Hows your Sunday been? Who's been your celeb hair of the week? And have any of my handy hints helped? Thanks for the grip tip, chick (like my way with words?) I shall try that next time I attempt big hair. Diana Vickers looks unrecognisable, but very pretty. Sad about your wee pooch, such a cutie! So sad. Hope your lad has cheered you up. Oh Kel, I'm just catching up on posts and I'm so so sorry about Dozer. I'd never say "just a dog" - I've been heartbroken when we've had to have pets put to sleep and it still hurts to think about it now. I hope Holly is providing some extra cuddles for you. 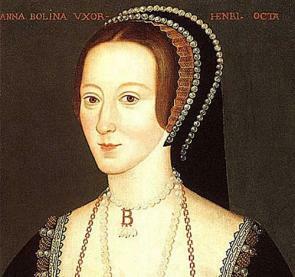 Anne Boleyn was considered quite daring for wearing her hair in that French hood. Looks tame to us nowadays but showing that little bit of hair and wearing something more flattering than a clunky Spanish hood made all the difference! I remember reading she was really headstrong, fair play to her! :) Thanks for your kind words Alex, Hols is indeed putting in the extra cuddles, poor thing is looking for an escape route from being squeezed too often! Jo (is it Jo?! Sorry how rude of me!) no worries on the comment, and the man bought me perfume so he's done well. Hair might be the second fastest growing tissue but mine's not growing fast enough for me! Grr! Love Diana's hair! Great kirby grip tip!